Canadian technology giant Research in Motion announced healthy financial results today, with quarterly profits of $643 million (£390 million), up from $483 million (£290 million) this time last year. RIM shipped approximately 7.8 million BlackBerry devices in the three months ending May 30, with 3.8 million new subscribers taking its total to 28.5 million users. However, new subscribers are slightly down from the first quarter, while revenue was up by over 50 per cent, indicating that RIM is working harder for its profits. "We are starting fiscal 2010 with strong financial performance and impressive market share gains, including a 55 per cent share of the US smartphone market according to IDC's latest estimate," said Jim Balsillie, Co-CEO at RIM. RIM continues to make most (81 per cent) of its revenue from selling handsets, earning just 13 per cent of its profits from service and a tiny 2 per cent from software, such as that sold via the App World. 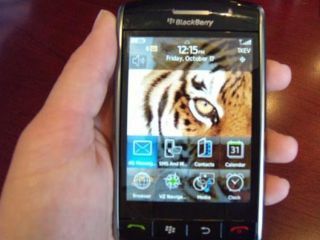 RIM expects to add up to 4.1 million new subscribers in the next quarter - an ambitious call given the launch of the Palm Pre and the iPhone 3G S.
It will be launching the BlackBerry Tour in the months ahead, and is expected to have a new Wi-Fi-packing touchphone, the Storm 2, in time for Christmas.